Johnston County is a Raleigh exurban county located in east-central North Carolina. As of 2010, the population was 168,878. The county seat is Smithfield. The county was established in 1746, named for Gabriel Johnston, who was colonial governor from 1734 to 1752, the longest tenure in the state’s history. Predominately rural, agricultural still plays a key role in the county’s economy. 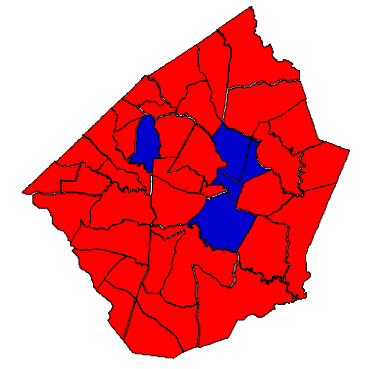 Politically, Johnston is one of the redder counties in the Triangle region, owing to its exurban nature. Though a fast-growing county, most transplants lean Republican. The principal cause of this is a lack of any major city, which in North Carolina serve like liberal magnets. The town of Clayton is one of the fastest-growing communities in the state, with many transplants from the Northeast. The inhabitants of most of Johnson’s rural communities tend to vote in a predictable fashion. In comparison to other counties in eastern North Carolina, there is a relative lack of African American voters. These factors combine to make Johnston a safe Republican county. Both John McCain and Mitt Romney won here with over 60% of the vote. Johnston County is located in the 7th congressional district, which extends all the way to the southeast coast. It is currently represented by Democrat Mike McIntyre, a “Blue Dog” and one of the most conservative Democrats in the House. Former State Senate David Rouzer hails from Johnston County and challenged McIntyre in 2012, but lost by less than 1,000 votes. It was the closest U.S. House race in 2012, and Rouzer is gearing up for a rematch in 2014. Rouzer’s margin in Johnston County will go a long way toward determining the success of his second bid. Forecast: Johnston has not voted for a Democratic presidential candidate since Jimmy Carter in 1976. Even though the county has boomed in population, the Republican advantage has not dissipated. There are still conservative Democrats in Johnston County, but they now vote overwhelmingly Republican; Bill Clinton in 1992 was the last with a respectable showing among this group of voters, but his liberal policies and administration’s attacks on tobacco alienated them. The growth rate during the 2000s was 38.46%, which is massive. High gas prices have had an effect on in-migration to exurban communities, this, combined with the recession, should halve the growth rate by the time of the next census. At present, things look bleak for Democrats in Johnston County, with no sign that things will improve in the near future. The growth in the Hispanic community, however, is a promising statistic. Unfortunately for Democrats, rural Hispanics are one of the least organized and politically active groups in America. Still, because Johnston is one of the fastest growing counties in the state, it bears watching. For now though, the county is a rich source of votes for Republican candidates running statewide, and one of the few areas of the state where growth has helped them rather than hurt them.